lifetime of pages: Swirlydoos March Reveal and Blog Hop!! 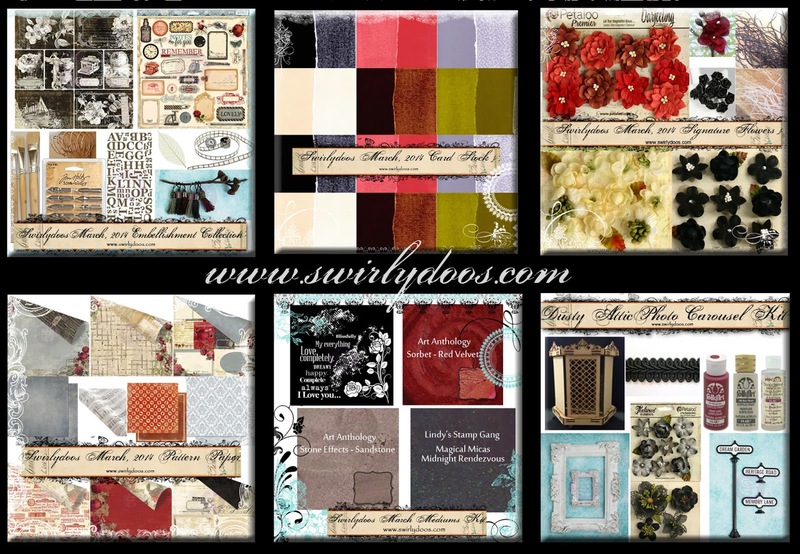 Swirlydoos March Reveal and Blog Hop!! If you came here from the Die~Namites blog, then you are on the right track. If not, go back to Swirlydoos' blog and start from there. We have some amazing projects for you to see today !! Make sure to leave a comment on all of the blogs for a chance to win!!! Make sure you have LIKED & FOLLOWED Swirlydoos on Facebook!!! Everything is from the Main Kit and Add-ons except for the doily (courtesy of my local Dollar Store). Using distress inks and texture paste, I created the background with a TCW ledger stencil. The burlap flowers coordinated perfectly and I love the wired mesh ribbon! The Prima diecut clock was embossed with clear chunky embossing power,then cracked and inked for the vintage effect. I realize the brushes in the Add-on were probably meant to be used to paint, but I couldn't resist working them into the theme! My backgound was misted with Heidi Swapp in Tinsel, Tattered Angel in Cinder and Lindy's Stamp Gang in Steel. Then I applied a layer of Ranger crackle paint in Soot. After that dried I used the French Script stamp from Something Tattered and Ranger Gold embossing powder to add more texture. The Kit and Add-ons include such fun little embellishments like the pen nubs and sweet tags.The Prima wooden butterflies were simply crackled and pasted in flight. I fussy cut the border and created a anchoring area using gesso, an older Prima stamp and Perfect Pearl Powders in red and silver. There is more of it but it got covered up as I added layers! The mats and chipboards made it easy to effortless match and layer.I embossed the mats with a Tim Holtz brick pattern which shows up better in real life. The swirls were cut on my Cuttlebug and embossed and inked for texture. I simply glittered the Prima dragonflies for some bling! You have until midnight, eastern time, on Friday, 3/7 to complete the hop. Winners will be announced on the Swirlydoos Blog on Saturday, March 8. The party continues over at Amy V. 's blog. Have fun! Great layouts. Your take on the sketch challenge is my favorite. I love all the layers, fussy cuts, embossing....oh I just LOVE everything you've done. I'll be coming back often once I get my kit to see what I might be able to do with it. 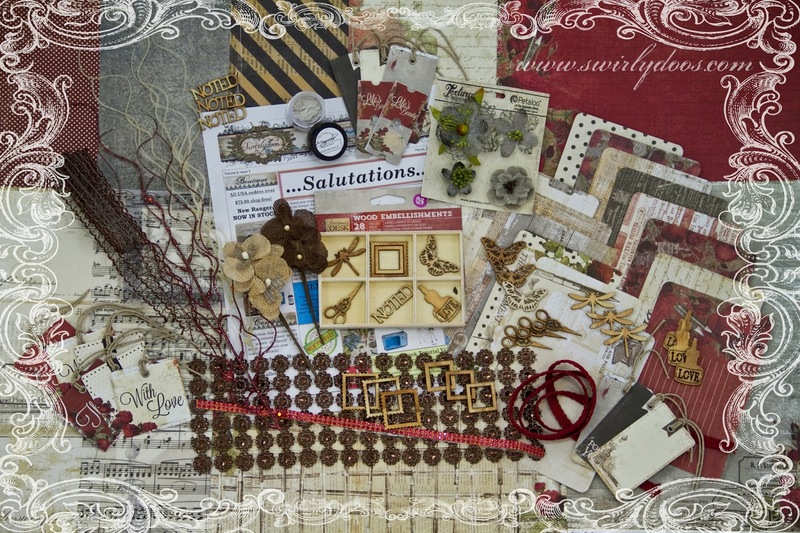 It is soooooooooo GOOD to have you with us, and your work with this month's kit is just FABULOUS!!!! Love your detail work!! Thanks for the close ups. Love them. Your layouts are amazing!! Love how you used the paintbrushes!!! So many great details to keep you coming back to look again just in case you missed something before!! TFS! the second layout is so pretty with the muted colors but I really like the bright pages with the reds. All of them are so pretty. Great job. Beautiful layouts!! My fav is the one with the girl in the red dress which is gorgeous! Lovely layouts. I adore the sketch challenge layout. Your daughter is beautiful! I love how you incorporated the brushes into the layout! genius! Your pages are just amazing!! I love that you made those paint brushes a part of all the gorgeousness! 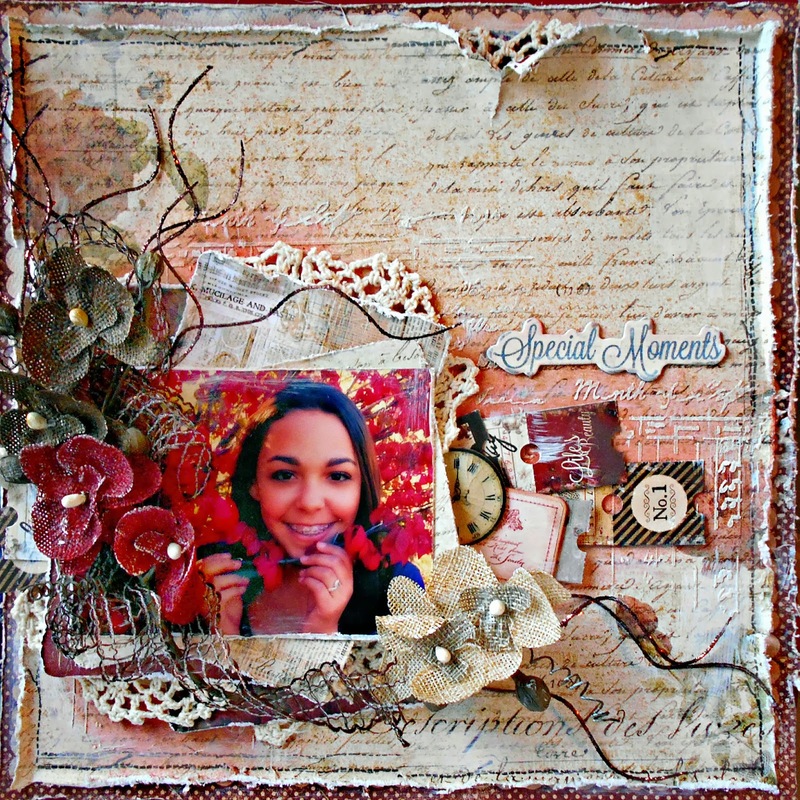 Love the way you used the beautiful reds in your layouts. Great job Tracey. Wow Tracey such gorgeous layouts you've done with this months kit! Wow - great to have you on the design team - fabulous debut. Stunning pages Tracey!! Just LOVE what you have created with this kit!!! Tracey, your layouts are so beautiful. I love the way your incorporate texture with doilies and sewing. i am speechless, these are just amazing, there is so much detail. I am envious. I love your style! Your "neutral" page is adorable. There is nothing neutral about that. what an awesome debut! LOVE al the layouts although the second one is my fav! Love the embossing in the background! Beautiful pages!! Thanks for the close ups! Wow the details on your layouts are amazing. These are gorgeous and I love how you made a frame from the bling "ribbon". Thanks for sharing. such an awesome layout, love all the details in it! Beautiful, gorgeous LO! Love all the details, specially the fussy cut border. Great idea! I like that you have shown how to use the kit in different ways. And all of them are so beautiful. Beautiful LO! Love all the details and the layering. Just swinging by to say congrats on your debut! Aweome work with the kit, gf! these layouts are superb, Tracey! Love love LOVE! Live love love the dark page with the brushes. The neutral tones just POP off the black background. I love the layering with the flowers from the kit. Very nice. Beautiful pages. Love the idea of using the paintbrushes on the page. Яркие работы. Спасибо за хорошее настроение. I love,love LOVE your pages! They are gorgeous!! I also love your blog ! Very beautiful! 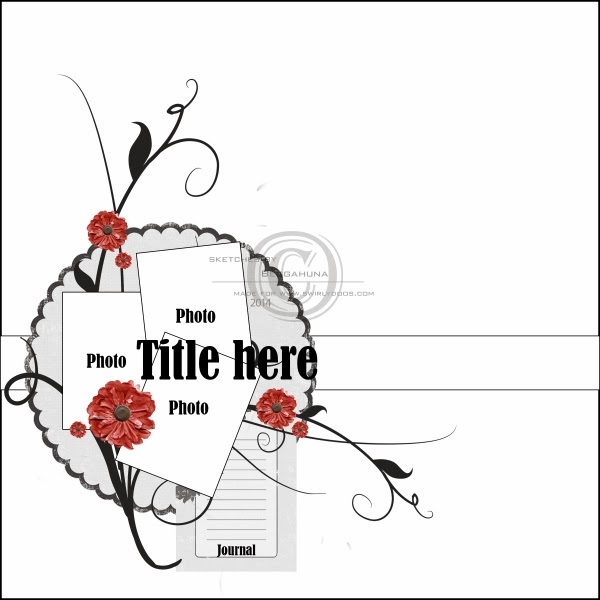 Love your layouts, the black background with gold embossing is fabulous. always you do and stunning job! I love the fun way you used the paint brushes...just perfect!! THIS is why I'm so glad that you're back "home"!!! 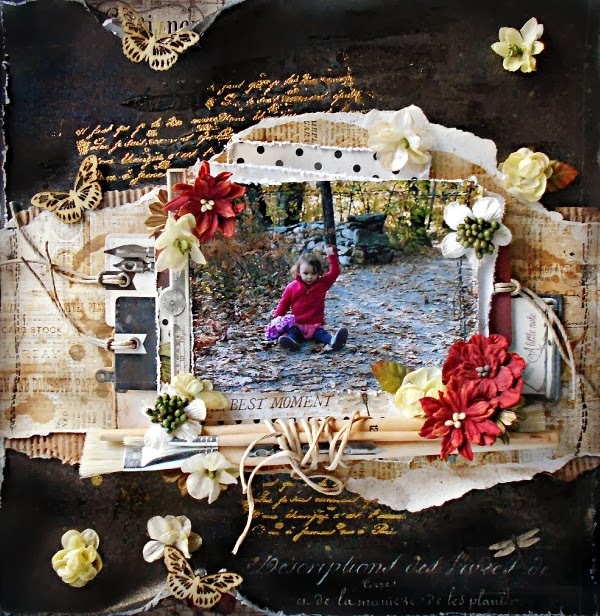 Stunning pages, all filled with the perfect blend of shabbylicious distressing and layering mixed with textures and colors, flowers and trims and so many fun embellishments!!! Oh, your layouts are gorgeous. I love all the layering and fussy cutting on your last page. Thanks for sharing. 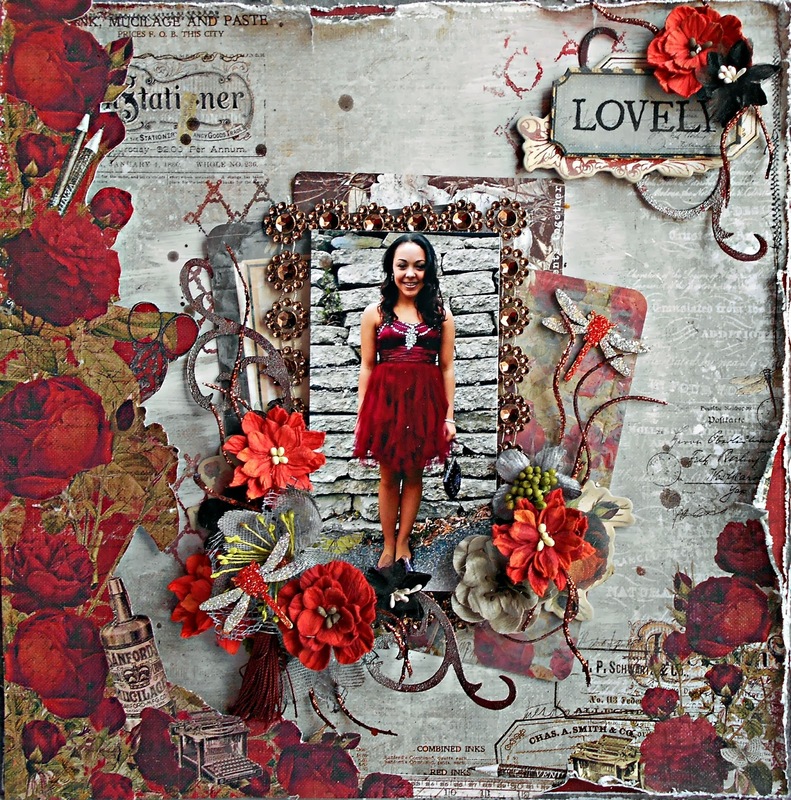 Beautiful creations with this kit, Tracey! Congratulations, again, on being part of the DT! WOWZA! Simply gorgeous, Tracey. I love your work so much. You rocked this kit!!!! !